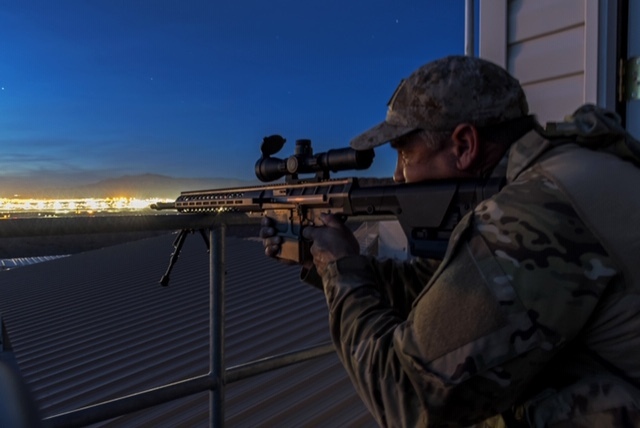 For the professional Sniper/Observer team, an urban environment is filled with many daunting challenges. The skills to operate in a metropolitan landscape are essentially the same as most other Areas of Operation (AO); but, an additional knowledge base is required to instill the confidence and the flexibility needed to maximize your effectiveness as a precision shooter. A few years back, we had a new technician on our team who had just returned from a sniper course hosted by an outside agency. We received a hostage call at approximately 03:30 one night, where an estranged husband was holding his children in a house at gunpoint, threatening to kill everyone. I was the first sniper to arrive on scene and immediately began looking for a Final Firing Position (FFP) on the front side of the suspect’s residence. Directly across the street from the scene was a single-family, two-story house which had a large backyard surrounded with chain-link fence. Inside the yard were several large, potted plants scattered around. I pushed three of the plants together in a deep corner of the yard to build my hide site. That also allowed me to move several of the remaining plants to where I wanted to further obscure the FFP. This location allowed observation deep into the suspect’s residence. Should the team use an explosive breach to make entry and conduct a rescue, I could still provide overwatch. Once the FFP was established and appropriately concealed, I began directing the other arriving snipers to positions around the suspect’s residence, which allowed us to cover all the angles. When our newest sniper arrived, he came up on the radio and I directed him to my position. As was the senior marksman on the scene, I felt we could use the unfolding scenario as a learning opportunity. When he arrived at my location, he began to tell me we needed to move our position due to the chain-link fence. I asked why, and he replied that we couldn’t shoot through it. I smiled at his objection, and told him as soon as we were done with this mission, I’d take him to the range and teach him how to shoot through loopholes. The point of my bringing up this specific situation is not necessarily about the fence, but to raise an important point about training: not all “sniper” courses are the same, and some do not prepare a precision marksman to be fully-functioning on Day One of that person’s career. Most, if not all, law enforcement sniper courses focus on the pulling of the trigger. I can teach a monkey to lay down on a square range and pull the trigger on a target at a known distance. That does NOT make the monkey a sniper. What I try to teach to a new sniper is how to solve dynamic, tactical problems. The agency sending a sniper to me should have already taught that person to shoot. We will absolutely refine the established skills, but, there’s no need to get caught up spending hours, if not days, talking about ballistics, weapon systems, and optics. That is basic knowledge a marksman should know before setting foot in my classroom. Let’s discuss the basics of choosing your weapon system first. With the latest advancements in ballistic technology and manufacturing, a sub-MOA rifle with a variable-power optic should be your baseline. When having to shoot through intermediate barriers, or take shots to end volatile situations like a hostage taking, quality glass on a rifle accurate enough to consistently place shots within a couple millimeters of each other is a must. Traditionally, a sniper would have five different rifles and optics, ranging from .223 Remington up to .50BMG—with multiple rounds available per weapon system. It’s hard enough to train with one weapon system weekly, and we’d be asking a sniper to train on all five every week?? It’s just not practical, or even necessary. Now snipers can carry a multi-caliber weapon system, allowing for greater versatility and lethality during operations. One of the key benefits of this functionality is the shooter can utilize the same optic and reticle for every available caliber. Not only does it create uniformity, but it is also very cost-effective—from both a training and operational perspective. On 13 June 2015 at approximately 1230 AM local time, James Boulware pulled up to the headquarters building of the Dallas (Texas) Police Department in an armored vehicle, where he began shooting at police with a semi-automatic weapon. SWAT responded to the scene, and one of their snipers employed his .50-caliber sniper rifle to disable the vehicle and neutralize the threat presented. On 17 May 1995, just after dusk, Shawn Nelson went to a National Guard Armory in San Diego, California, and stole an M60A3 Patton tank. Once escaping the parking area in the Armory’s yard, Nelson went on a rampage with the tank, destroying cars, city infrastructure, and even an RV. At one point, the tank became high-centered on a highway median, which allowed police officers to climb onto the tank, open the hatch, and shoot Nelson. So how does a sniper determine which weapon to employ? To determine that, a wide variety of factors need to be considered. What is the nature of the mission? Is it a lone suspect barricaded in a house? Hostage situation in a bank? Active shooter in a high school? Counter sniper? What is the suspect armed with? What is the perpetrator’s level of training? What is the likely engagement distance? What is the composition of the structure the suspect is in? What’s the potential for collateral damage? Once a sniper processes all these factors, a determination will be made on the weapon system. You want the caliber which can stop the suspect instantaneously under the given conditions; but, you would be wise to choose one which minimizes the risk of over-penetration, which could endanger hostages, other civilians in the vicinity, or other first-responders on scene. In December of 2015, my team was called out and responded to the north end of town reference a barricaded suspect. A female subject had earlier pointed a firearm at patrol officers conducting a welfare check. Upon my arrival to the scene, I got into a position on the front side of the structure. As the call-out continued, a fellow sniper rendezvoused at my location. We discussed the use of bonded ammunition for this incident, due to a mother with small children refusing to evacuate from their home, which lay directly behind the suspect’s house. To minimize exposure, we opted to use a match-grade round in the event we might need to shoot. We also confirmed, via the snipers covering the rear of the target, the fence in the back yard was made of brick—not chain link. As it turned out, the female exited the residence with a shotgun and pointed it in the direction of the entry team. Snipers were forced to engage, neutralizing the threat. During the engagement, of the match-grade rounds passed through the suspect’s body, continuing out of the residence through the sliding kitchen door, where it struck the rear block wall. The point of secondary impact was approximately 30 feet from the house occupied by the mother who refused to evacuate with her children. To reiterate: weapon and ammunition selection are absolutely critical to your mission planning as a sniper. Choosing the correct round is always an area where things start to get confusing. Law enforcement snipers will generally have the ability to choose the type of round needed for a particular operation—either match or bonded, but even that is limited to what the department has authorized, and any deviation from that may open disciplinary action and civil liability. All snipers should be able to choose the best weapon and ammunition combination for the mission, due to their increased knowledge of ballistics and barrier penetration. Most of the time, the person ordering the ammunition does not possess that same level of knowledge, or have an appropriate background to understand how complicated those choices can truly be. A lot of times, the supply officer simply orders whatever is the cheapest or what they can get a deal, on and then the marksman is stuck with it—which leads us into training. Training is a constant in the Sniper’s life. They are always trying to be the best they can be, knowing lives are at stake every time there is an activation. Training must be a scheduled event, and should be weekly to correctly maintain proficiency in all the requisite skills. Sometimes training can be as simple as a “tabletop scenario” discussion about a previous situation elsewhere, which forces the sniper make decisions shoot/no-shoot decisions based on the given tactical criteria, as well as discussing potential outcomes. The list of topics where we as snipers need to build our knowledge and maintain proficiency is pretty much endless: moving targets; intermediate barriers; loop-hole shooting; man-tracking; engagement from aerial platforms; land navigation; ballistics; urban operations; vehicle hides; new technology; NVG and Thermal optics; and the list goes on. Point being, a sniper’s training must be both consistent and constant. Our SWAT Team is broken down into two units. We have 24/7 coverage, broken into front half and back half of the week, with Wednesday as our overlap and training day. One team is very pro-training; the snipers would train two or three times a week, even if it required coming into work early. The other team worked the busier days of the week, which consistently hindered their training time. In 2013, our team received a call about a male suspect in an apartment complex, brandishing a firearm while eluding patrol officers and attempting to get into apartments. One of the snipers from the other team arrived on scene first, and was directed by patrol to the general location of the suspect. The sniper was also informed the suspect had already exchanged gunfire with the patrol officers. The sniper soon located the suspect: he was on the 3rd floor of the apartment building, standing in the breezeway between the south and north wings of the building. The sniper directed more arriving SWAT technicians to the north side of the structure—just in case the suspect ran. Once the suspect realized SWAT was setting up containment, he attempted to kick in the door of an apartment, then occupied by a single female home alone. Our sniper chose to deploy with his bolt-action, .308-caliber sniper rifle loaded with bonded ammunition. When the suspect attempted to kick in the apartment door, the sniper was forced to engage—to prevent the suspect from taking the apartment’s female occupant hostage. Unfortunately, the fired round struck a metal railing, deflecting the bullet’s trajectory enough that it went over the top of the suspect, through the occupied apartment, and exited the north side of the building just a few inches above the heads of the entry team. The suspect realized he was being shot at, so he ran north through the breezeway in the direction the entry team. There was an exchange of gunfire and the suspect was neutralized. There were a lot of lessons learned on this operation, but the point is this: had the sniper been training consistently, despite the hectic schedule, I’m very confident the woman occupying the apartment and the SWAT technicians on the entry team would never have been endangered. In urban environments, there is higher population density, increased media activity, a myriad of visual obstructions, slope angles, pets, and all sorts of intermediate barriers to deal with. Precision marksmen must clearly understand the rules of engagement for aggressive animals, Hostile civilians, and the laws governing the use of deadly force. The most important factor for urban operations is adherence to Rule #1: ALWAYS blend into your surroundings, regardless of where the mission takes place. Secondly, with high-resolution maps and tools like Google Earth readily available, the sniper needs to plan discreet INFIL and EXFIL routes, as well as identify potential FFP sites. When determining those locations, a precision marksman must remember to make sure all the entrances and exits of the target location are covered. Depending availability of manpower and length of operation, the sniper/observer team may want to bring security personnel with them; however, this will increase the footprint and increase the likelihood of compromise. Once the FFP has been established, the sniper/observer team must ensure the position does offer both cover and concealment, and blends into the surroundings. The team must relay their position back to the command post, along with any exigent intelligence. The pair must also finalize their cover/concealment, plan escape routes if things go badly, conduct detailed visual search of the target building via the rifle scope, spotting scope, or binoculars, and start a range card for distances between their position and known points on the target location. A topic typically overlooked is what happens after a precision marksman pulls the trigger. I teach a class about the “sniper mindset,” where we focus on several areas that allow a sniper to be prepared from beginning to end—no matter how the operation finishes. For example, we discuss the fact that a sniper engagement does not automatically mean the end of the operation. On the contrary, it may be just the beginning. What if there are more armed suspects on the location?? Even if it’s a barricade with a single suspect who is successfully neutralized with the first shot, a sniper must still be ready to cover the entry team as they move to secure the suspect and clear the structure. We also discuss what happens to the sniper after the mission concludes. For example, if it’s a law enforcement agency, there will be a full investigation into the incident, step by step, start to finish. Even in a military sniper engagement, there will be questions to answer about why the trigger was pressed and rounds were sent downrange. A sniper may feel as though they’re being second-guessed, and may end up questioning their own actions. In March 2014, I was called to a freefall drop zone. There was a subject barricaded in an RV who had fired shots at the personnel manning the drop zone, and threatened the responding patrol officers. When I arrived at the scene, I put on the top portion and veil of my ghillie suit, and made my way to a position which allowed me to look inside of the RV. While I was in position and coordinating the other arriving SWAT technicians and snipers, I could see the suspect inside, watching the entry team as they arrived and prepared to move to a forward position. I could see the veins bulge in his neck as he was screaming at them. At one point, the suspect stepped out of the RV, armed with a Soviet-era SKS semi-automatic rifle. He chambered a round and began to shoulder the rifle, which indicated an intent to engage the entry team where they stood. I responded appropriately and negated the threat before he could fire on my teammates. My decision to shoot invited a lot of criticism from people not on the scene and, more importantly, did not have a firm grasp of all the variables. For example, traffic on the highway near the location of the standoff was backed up for miles, and traveling at only 5 mph. The effective range of the SKS rifle is 400 meters, and the distance from the suspect’s RV to the highway was approximately 200 meters. So not only was the entry team endangered, but so were a staggering number of civilians traveling that section of highway. Most of the criticism came because the information presented was very general, stating only that the suspect was in the middle of the desert in his RV when I engaged him. When you’re on the scene and end up employing your weapon, the last thing you want to hear is that others—especially your leadership—have issues with your shot, and a criminal investigation into your actions is about to ensue. That alone will create an unbelievable amount of anxiety in anyone. In my situation, once all the facts were presented and the totally of the circumstances at play were considered, my actions were legally justified under department policy, as well as both state and federal statute. It was also morally the right decision. The reason I bring up this up is to show, as precision marksmen, the need for open and honest discussion about how things play out after the shot. It also addresses the need of leadership or administrations to have both faith and trust in the knowledge, training, and experience of the snipers. The legality of your actions should always be discussed and prepared for, to include the possible presence of an attorney to represent you after you’ve applied your training in a real-world situation. The list of potential topics to discuss with urban sniping is pretty much endless. There is neither the time nor the space to touch on all of it, but my goal was cover what I feel are the most critical points. So to close, I will leave you with this thought: whenever you’re moving out for a real-world operation, always approach it with the thought of, “I’m going up against someone who is better trained than I am.” First and foremost, that realization will keep you humble and eager to both learn and train as much as possible. Secondly, it will keep you from taking a lackadaisical approach to the mission, thereby minimizing the risk of you or any of your teammates being critically wounded or killed. Be smart, train hard, and continue to hone your craft. Charles Moser is a man with a mission. When he takes someone out to learn to shoot for the first time – or to improve their shooting skills – the focus is on safety first and accuracy second. Moser has much to share with men and women alike. A former member of the U.S. Navy SEALs and a current SWAT Team member, he is an elite special operations operator with more than 30 years of education and training in military and civilian law enforcement activities. He merges the best of both worlds toprovide a unique immersed training experience that's fun and productive at the same time. On June 11 and 12, 2016 in Las Vegas, Nevada, SWAT Concepts will be holding our Two-Day Long Range Hunting Course. The course offers beginner and experienced hunters an opportunity to learn and fine-tune their long range skills. Our small class size also ensures unmatched personal attention so you can focus on the aspects of the hunt that excite you most. Students are asked to bring their own preferred weapon and 200 rounds of ammunition so we can make sure your success continues after the course ends. If you are intrigued by the thought of improving your marksman capabilities to the point where you’re shooting with accuracy at more than 1,000 yards (and up to one mile) out, this is the course for you. Working with a knowledgeable, experienced sniper like Charles is a real game changer. The cost is $999 per preson and space is limited. On April 19, 2016, an article in the Las Vegas Review-Journal reported that Wes McBride, a retired gang detective in Los Angeles and Director of the California Gang Investigators Association, stated that homicides in the Las Vegas Valley are up a whopping 91 percent this year from the same period in 2015. Many Las Vegas residents remain concerned about this spike in violent crime. To this end, SWAT Concepts of Las Vegas, Nevada, is pleased to announce that we will be holding a 2-day Personal Protection and Home Defense Course in Las Vegas, Nevada, and Orange County, California. The instructor is none other than expert, Charles Moser, a former member of the U.S. Navy SEALs and a current SWAT Team member. He is an elite special operations operator with extensive education and training in military and civilian law enforcement activities. With more than 30 years of experience to draw upon, Moser merges the best of both the U.S. Navy SEAL and Police SWAT operations in an effort to provide a unique immersed training experience to the general public. Moser shares: "Whether you're at home, on the street, or traveling in the U.S. or abroad, men and women alike need to know what to do to protect themselves. Often, it takes five to seven minutes after calling the police for help to arrive. What you do in those precious five minutes is up to you." The training includes weapons and gun safety instruction, lecture, demonstration, and a day at the range. Each participant will leave better prepared and more confident in their ability to observe their surroundings, put necessary measures in place, and protect themselves and their loved ones. The Las Vegas, Nevada course will be held June 25 and 26, 2016; it costs $399. The Los Angeles County course will be held on May 18 and May 19, 2016 in San Dimas/Azusa, California. The California course is presented in conjunction with Sure Shot, A Civilian Readiness Company and costs $350, plus a $30 range fee. Space is limited for both locations.